There may be room for that special someone in your heart. But how about in your closet? Sharing a space with your partner can be a challenge, but if you follow a few simple steps, you’ll find there’s more to love for both of you. See what each of you brings to the relationship. Take an honest look at each of your wardrobes and how much space you need to accommodate them. Consider how much space each of you needs for shoes, folded clothes, and hanging garments such as shirts, slacks, suits and dresses. This is an ideal time to pare things down. Keep what you love and donate the rest. Once you’ve decided how much space each of you needs, split the closet into two sections. A central tower of drawers or a hutch creates an attractive focal point and provides a dividing line that clearly marks off space for each of you. Make room for your favorites. Plan space in the middle of your closet for the clothes you wear most often, using double hanging rods to accommodate all of your everyday clothes without crowding. Add pull-out belt or tie racks or a valet rod to hold clothes while you plan your outfits. Keep track of the little things. Next to your everyday clothes, include drawers that act as a built-in dresser in your closet to hold undergarments, socks, and folded items. You can also add a jewelry tray to keep watches and precious jewelry organized. Help out with the chores. A fold-down ironing board makes last-minute touchups quick and convenient, and see-through wire baskets help you find items quickly. A pull-out hamper keeps worn clothes out of the way until you’re ready to carry it down to the laundry room. Slanted shelves keep your entire collection on view so you can match them to your outfit. Using adjustable shoe shelves allows you to leave more space for any tall boots in your collection. 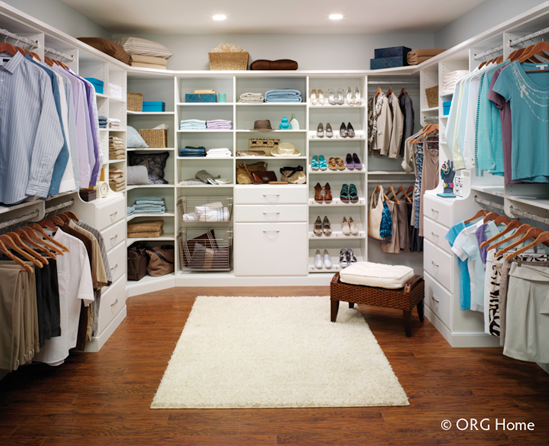 A master closet is more than just a place to hang your clothes. Taking time to organize the place where you and your partner start and end each day can bring harmony to your home and your relationship.